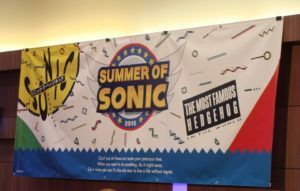 A new E3 means a new Sonic game and this year’s major Sonic release is a pseudo-sequel to Sumo Digital’s SEGA crossover games. While the first outing had SEGA’s superstars matching together in SEGA Superstars Tennis, the remaining titles revolved around Mario Kart racer-inspired titles with the previous one featuring transforming vehicles in Sonic & All-Stars Racing Transformed. As the name implies, Team Sonic Racing calls for Sonic & Nobody Else All-Stars Team Racing. Some folks from Sonic Retro and SEGAbits, including myself had hands on playtime from SEGA’s booth at the show floor. You can either hit the jump to check out impressions from me and Neo Hazard or hop over to our sister site SEGAbits for a tertiary (or perhaps quaternary) view from SEGAbits writers Kori-maru and Dakota. Inside SEGA’s booth were a dozen demo stations for both Sonic Mania and Sonic Forces making their first and last E3 appearance. Con-goers did their best to pilfer posters given out any way they can. E3 was packed this year due to the convention allowing the public to enter for the first time in years which means the lines were more than double and that means plenty of eager people wanting to check out whats new. UPDATED: The postmortem podcast will air at 7PM central instead of 5PM central to make time for more awesome guests to arrive! 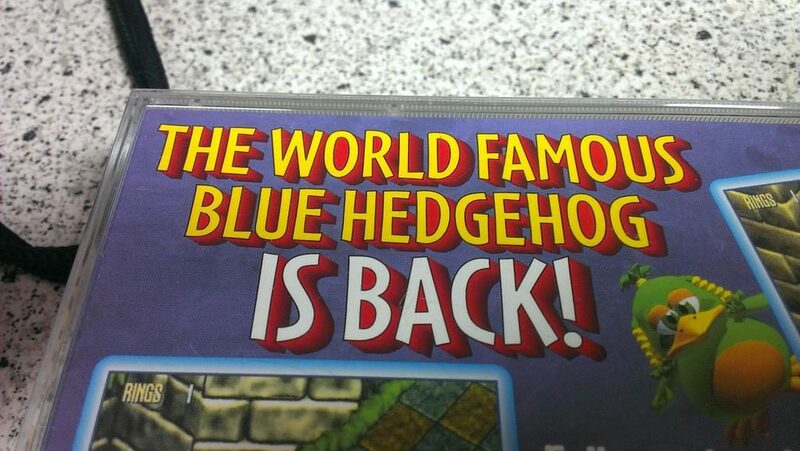 The Sonic Mania hype may be coasting at this point, but we’re just getting started with the celebration of “The World Famous Blue Hedgehog” by hosting a live podcast on SEGA Channel Retro on YouTube this Friday at 5PM central. Sonic Retro and SEGAbits were live and in person at the event and we’ll talk about the event, Sonic Mania, Project Sonic 2017, Totinos, LEGO Sonic the Hedgehog and more! The second Christian Whitehead, better known as Taxman, posted his YouTube video presenting his Sonic CD remake for iOS, he became a household name. 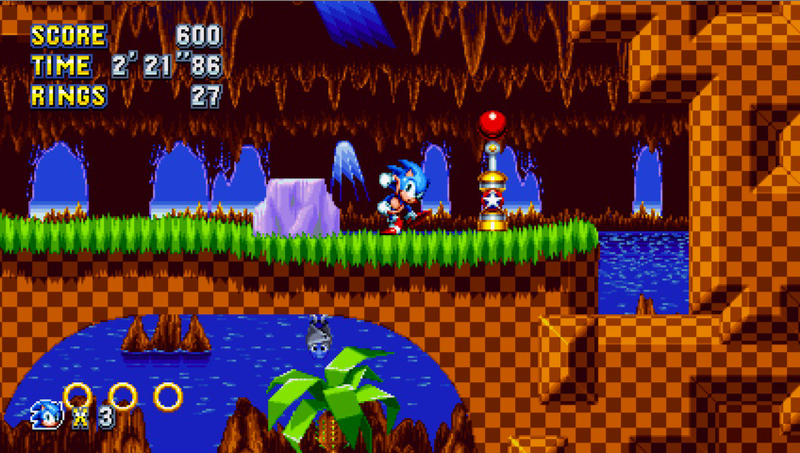 Folks had known him before, but for the first time, a fan’s efforts had caught SEGA’s attention and sure enough, we got the Sonic CD remake, then the original Sonic 1 and Sonic 2. Fast forward to 2016, and Taxman, along with Headcannon and PadogaWest Games are bringing us a brand new experience feature select levels from Sonic’s past, as well as brand new levels for fans to explore and enjoy. Sonic Mania is the game fans never thought they’d see again, but at the 25th Anniversary Party, we didn’t just get a trailer: we got to play it. Hit the jump for thoughts from Sonic Retro’s own Bartman3010 and myself. We played Sonic Mania, and now we’re going to tell you what we think! In this SEGA News Bits, George and I (Barry) rest our aching feet just hours after the Sonic the Hedgehog 25th Anniversary Party in San Diego to share our reaction to the Sonic Mania reveal and give our thoughts on how the game plays. Do we have another Sonic 4 on our hands or is Sonic Mania the true successor to Sonic 3 & Knuckles? The answers are obviously “nope!” and “hell yes!” in that order. Special thanks to Neo Hazard for letting us use his footage, you can check out his channel here! Also, thanks to Bartman for being the one to play the game in our footage. You can find Bartman’s YouTube channel here! SEGA News Bits is a production of SEGAbits, covering all things SEGA and Sonic the Hedgehog. When we touch on Sonic stories, you’ll be seeing them here on Sonic Retro as well. If you enjoyed this episode of the SEGA News Bits, make sure to subscribe to our YouTube channel and never miss an episode! Pre-recorded just hours after Sonic the Hedgehog’s 25th Anniversary Party wrapped at the San Diego House of Blues, it’s Barry and George’s first impressions of the night! Hear how the event went down, from the literal all the way around the block line to the game announcements to the final curtain call. How did the audience react to the return of Taxman and Stealth? Why do people faint when they hear the opening guitar licks to Crush 40’s “What I’m Made Of”? Where was the computer room? These questions and more are answered in this very special episode of SEGA News Bits!